World Climate Report (hereafter WCR) does not provide author information. However, most recent cited articles (for example, at the Cato Institute) give WCR chief editor Patrick Michaels and WCR administrator Paul “Chip” Knappenberger as joint authors. Moreover the blog post in question, What’s Happened to Global Warming, is completely consistent with Knappenberger’s repeated claim that “global warming has stopped”, made recently at the Heartland Institute conference and elsewhere. So until otherwise advised, it’s reasonable to attribute the article to the pair. (It’s also worth noting the ties of these authors and World Climate Report to interests implacably opposed to the regulation of greenhouse gases, as documented at the SourceWatch links given above). So, without further ado, here are Michaels and Knappenberger on Easterling and Whener’s Is the Climate Warming or Cooling (Geophysical Research Letters, 2010)? The trends for 2000-2009 are also positive in all three surface data series. So even if one accepts the short-term linear trend as an appropriate metric, the claim that “thermometer-based global temperature records show no warming whatsoever over the past decade” is an outrageous lie. No more, no less. Notice that “nearly flat” is now simply “flat”. They might as well have replaced “nearly” with an ellipsis “…”. That would have been so much simpler. And, once again, Michaels and Knappenberger exploit confusion about exactly which period (which “past decade”) is being discussed. But it gets better. For there is the niggling matter of the citation for this sentence from Solomon et al, which turns out to be – wait for it – Easterling and Wehner! But, as we have already seen, that paper points out that the trend “since the late nineties” depends very much on the selection of the start year. 1998-2008 gives a range of linear trend from 0.11C/decade (NASA-GISS) down to 0.02C/decade (HadCRUT). But if one starts in 1999, NASA-GISS jumps to 0.19C/decade, while HadCRUT is at 0.11C/decade. So it’s even somewhat debatable whether this set of linear trends should be called “nearly flat” since the “late nineties”. But what is not debatable is the dishonesty of Michaels and Knappenberger in citing Solomon et al as further support for the mendacious claim that surface temperatures have been categorically “flat” and that there has been “no warming whatsoever over the past decade”. That’s especially true when one considers the actual numbers. 2000-2009 saw linear trends of 0.12C/decade in NASA-GISS and 0.05C/decade in HadCRUT. But that’s only part of the story. If one looks at decadal change in 2000-2009 relative to the previous period, both NOAA and HadCRUT were an average of 0.17C above the 90s, while NASA-GISS was a full 0.2C higher. Not that the contrarian obsession with short term linear trends figure much in Solomon et al; rather, they present a smoothed average of all three surface temperature data sets. Measured and modeled temperature changes relative to 1980. Three different observed global temperature records were used (from ... NCDC, CRU, and GISS) with the green markers indicating the range across the three data sets in each year. The green shaded line shows the range of the 5-year running mean of the three data sets. The recent submission to Geophysical Research Letters of research by Michaels, Knappenberger and four others (including the surprise addition of James Annan) is bringing new attention to model-observation comparisons based on short-term linear trends. (Knappenberger’s controversial Heartland conference presentation can be viewed at the conference website [PPT presentation and video]). There are two contextual aspects that should be discussed in assessing this initiative, which seeks to endow short-term trend analysis with some respectability. First, it should be noted that up until recently short-term trends were rarely discussed in actual published climate science; in fact, the IPCC Fourth Assessment Report goes out of its way to eschew such discussion, preferring to present projections in terms of decadal or longer averages. For example, the medium term projection to 2030 are given in terms of a twenty-year average (2011 to 2030) relative to a twenty-year baseline (1980-1999). James Annan has noted that the Michaels et al analysis is in line with the approach of Easterling and Wehman, not to mention that of Gavin Schmidt at RealClimate. But these initiatives were meant to rebut the overreaching claims in the blogosphere, as noted above, not as indicators of the way to the most compelling analysis. They should certainly not be cited in support of the view that much can be concluded from a linear fit analysis of ten years of observational data. Clearly, there has been some “flattening” in the 2000s even if the assertion of “no warming whatsoever” is exposed for the canard that it is. But it’s equally clear that there are seeming contradictions in the data. GISS actually shows a slightly higher trend over the two decades than for the 1990-99 decade-long trend. HadCRUT’s low (but still positive trend) in the 2000s is somewhat contradicted by a more moderate reduction in the two-decade trend to 2009. And as already noted, the fact that all three series show significant increases in the 2000s relative to the 1990s should also give pause. I’ll be returning to the implications of such considerations, and alternative analyses of decadal change, in subsequent posts. In the mean time, here is last year’s initial tentative effort at an approach using smoothing and decadal averages. The treatment acknowledges that recent temperatures have been below projections, and at the same time avoids the miasma of interpreting rapidly fluctuating short-term trends. It should be noted that the stated confidence interval seems fine for the smoothed observation curves, but probably understates the interval for the decadal average. But the approach seems a promising one to explore – namely develop as a test statistic the average over a period of interest (in this case, the convenient decadal projection period 2000-2009), expressed as an increase relative to the immediately preceding baseline period. But there is a second, more disturbing, element in all of this. In his recent presentation at the Heartland climate conference and elsewhere, Paul Knappenberger repeatedly stretched his conclusions way beyond what could be reasonably inferred or interpreted from the actual analysis (and, yes, I will go into this in detail in a future post). And the categorical World Climate Report claim that there has been no warming “whatsoever” is a clear falsehood. That yawning gap between informal commentary and published research (whether one’s own or of others) is one of the defining hallmarks of “skeptical” climate science. That’s disgraceful enough, but it also indicates a possible willingness to stretch beyond acceptable limits even within the published research itself. Consider the following early paper by Michaels and Knappenberger, along with Robert Balling and Robert Davis. Observed warming in cold anticyclones was published in 2000 in the journal Climate Research. (This was only one of many dubious articles edited by Chris de Freitas, whose tenure eventually resulted in the mass resignation of half the journal’s editors in 2004). On a seasonally weighted basis, a relatively small area (12.8%) contributed over half of the annual warming, and in the winter 26% of the area accounts for 78% of the warming. Our analysis demonstrates that this warming is almost exclusively confined to the dry, cold, anticyclones of Siberia and northwestern North America. Strong warming that is confined mainly to the Siberian and Canadian winter has a much different effect on society than a similarly large heating in mid-latitude urban and agricultural areas during the summer. To us, this pattern of temperature change seems a logical ‘discernible human influence’ on the climate when the interplay between greenhouse changes and moisture content is considered. Warming of this air mass type may, in fact, be benign or even beneficial, although the final valuation of global warming remains elusive. So there is every reason to suppose that the latest Michaels et al submission may contain similarly exaggerated material in its background or conclusion. The refusal by Michaels and Knappenberger, at least so far, to release a draft of the submitted article (not even the abstract) does little to quell such doubts. While we’re waiting, there will be plenty of other Michaels material to ponder, including his ravings at the Heartland conference. And I’ll also be posting a complete set of abstracts and links for nine of Michaels’ articles at Climate Research (all but one edited by Chris de Freitas). The above quote is just the tip of the iceberg, unfortunately. This entry was posted in Climate science disinformation and tagged Chip Knappenberger, climate model projections, Patrick Michaels, World Climate Report. Bookmark the permalink. It’s disheartening that part of the review process might require checking for potential of quote mining. I don’t understand why a scientist of the quality of a Patrick Michaels cannot/ does not look beyond a 10-year trend. Interestingly, in his keynote speech during the 2007 or 2008 Heartland conference, Michaels validated the long term trend since 1880. In any event we are talking about a few decimals of a degree point. Nothing to be concerned about, is the message one should take from all of this. The temperature increase, if any is clearly nominal and well within global norms. In any event I am really enjoying the news reports that have taken a much more sceptical look at the science. Now that the MSM has tuned out it will be next to impossible to galvanize the public around any drastic action. When there is some actual quantifiable warming let us know. Until then I look forward to some more articles that read much like a literalists interpretation of the bible. On message to the end to keep the flock on their toes. Keep up the good work, the end is coming! is just one thing that might be mentioned. It is typical to release a submitted copy of a manuscript for public consumption while it is in the review stage? I thought most publications frowned on that (but, admittedly, it has been a while since I checked the fine print). However, in collegial correspondence with an eye towards getting some comments and perhaps adding some improvements, I’ll be glad to provide you privately with a draft of the paper. Please email me and we can discuss. [DC: As far as I know, AGU permits release of the submitted paper at the authors’ own website. This has been done with certain high profile articles or comments. You have released the main parts of the analysis in a highly publicized venue, along with several statements and informal comments interpreting the results. So why not release the whole thing? For a number of reasons, I don’t feel it would be appropriate for me to review the paper privately. The decade of zeros (2000 – 2009) was about .19 kelvins warmer than the 1990’s. Solomon’s paper tells us it could have been worse – perhaps .23. The comparison graphs show that large areas of the far north are over 6C warmer. NOTE: This is completely analogous to using the warmest temps of the warmest area during the medieval period as the warming to beat to pass the MWP. The average temperature is 0.15C per decade and there’s only a 3degree difference between a cool interglacial and glacial. 200 years. Of which we’ve gotten ~1/3 already. And accelerating. None of this is “a couple of tenths of a degree”. Of course, you’ll ignore any warnings until you’re in trouble, then you’ll complain bitterly how much you’ve paid in taxes but the government doesn’t help you. One curious side effect of arithmetic is that adding more and more “few decimals of a degree point” eventually produces a full degree. and beyond. As this is part of an on-going research project, I guess I am more comfortable (at least for the time being), in working through the details privately. I don’t think this is an unusual request. I am a strong believer in publishing in the peer-reviewed literature, so until there seems a more formal way in going from open review to publication, I am resisting simply an open blog release and discussion of the actual paper. Again, I’d be happy to have private discussion about the details and any comments/suggestions that you may have. Our goal is a formal paper that is of interest to the greater scientific community. As there are several similar papers that have been published on the topic (notably Easterling and Wehner, 2009; Knight et al., 2009), it seems like the there is some out there for this type of analysis. As long as you and Patrick Michaels refuse to withdraw such clear falsehoods as “no warming whatsoever over the past decade” and “the computer models … abjectly fail to explain recent climate behavior”, I could not possibly contemplate a private discussion with you about your research. I think you will find, from my slide 8 (surface) and slide 9 (MSU LT), that through December 2009, there are several trend lengths of a decade or more than are negative (i.e., not warming). Besides the difficulty that you have with me overlaying the observed trends on the model probability field, do you find the concept of deriving the model probability field itself unuseful? Let’s look at the figure for surface. I’ve already noted that the 10-year trend is positive in all three surface data sets (not that such a short trend length tells us anything meaningful). So is the 11-year. But you can get a negative trend at 12 years (without statistical significance of course), which happens to start with the super El Nino of 1998. This sort of cherrypicking is exactly what Easterling and Wehner criticized. So your statement concerning “no warming whatsoever over the past decade” is wrong, even with the dubious reliance on linear trend over the past decade (i.e. 2000-2009). And then you try to wriggle out of it by cherrypicking trends that include 1998. Even worse, though, is that this obsession with short-term trends obscures the true extent of decadal change in the surface tempearture record, as I’ve already explained in excruciating detail. I don’t think the short-term trends are meaningful, so as far as I’m concerned you are deriving the wrong model probability field. If one wanted to take a preliminary look at AR4 models and decadal change, the decadal average increase is a much better statistic to examine. And, yes, there continued to be significant warming in the past decade, relative to previous decades. It is very well known that one requires 20-30 years to obtain stat. sig. trends in the noisy SAT records? So why stop at 15 years? What was your scientific motivation for stopping at 15 years? How about comparing mean decadal temperatures? I would encourage you to extend your analysis to include trends up to 20 plus years. There are several problems with extending the analysis to 20 years. The first is that the observed record has a big volcano about 20 years ago–a forcing type that is not included in the A1B scenario. The second, is that the warming rate from A1B is not constant, so we can’t really use the projections much past the year 2020 and claim that they fairly well represent expected temperature evolution during the current period. 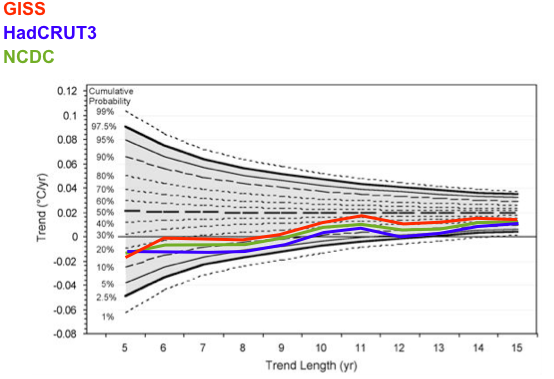 And using only model projections from 2001-2020 limits the degrees of freedom a bit in our trend distributions (i.e. we only have a single realization from each model run). The latter issue is not a killer in and of itself–so it is the former (Pinatubo) that presents more of a problem. I am also surprised that Knappenberger is upset with your critique of his work, work that he has elected to place in the public eye. If it is out there, then surely it is fair to critique it, especially when it is known to misrepresent the work of scientists (e.g., Solomon et al.). I agree with DC, Knappenberger and Michaels should retract the falsehoods contained within the WCR. You say I am not on point, but fail to support that assertion. You introduced Knight et al. (2009), I was addressing your misinterpretation of their work. IMO, you only have yourself to blame for that. For example, why on earth do repeatedly say (most recently at the Heartland Conference) that that “global warming has stopped”? That is an inaccurate, premature and grossly misleading statement. Not to mention irresponsible. I personally have no issue with scientists looking into noise/short-term variability in the climate system arising from internal climate modes. I do have an issue when that research or the results are blown out of proportion or not applied in the correct context as was done in the WCR. I also take issue with you and Michaels misrepresenting the work of Solomon et al. and Easterling and Wehner. I have asked you this before, but do you plan on issuing a correction/retraction? After re-reading the full article, I am not really as bothered by the handling of Easterling and Wehner and Solomon et al. in the WCR article as you all are. So, honestly, I have no intension of altering it. I’ve always maintained that contrarians make good lawyers and poor scientists. This post reveals several textbook examples of that, including 2 dodgy responses by Knappenberger. Contrarians, like lawyers cherry-pick evidence and phrases to support a weak case. So presumably you have the same difficulty with Knight et al. 2009. But I can’t seem to find your discussions about that work. Perhaps I am overlooking something. If not, then it would seem that it is more the message that you object to rather than the methodology. So had I reported that all was well with the models you’d be supportive of my methods? You seem to be trying to detract from the fact that you were caught misrepresenting the work of Solomon et al. (and others) by making some baseless accusations, and by introducing the red herring of Knight et al. (2009). In the interest of professionalism, honesty and integrity do you plan to issue a correction or have the WCR retract the offending/incorrect phrases? 1) Their data covered the period 1999-2008–well, we now have data until May 2010. The first decade of the 21st century was the warmest in the instrumented record, with 2009 the second warmest (after 2005) in the GISTEMP. 4) Also, from Knight et al. (2009) “These results show that climate models possess internal mechanisms of variability capable of reproducing the current slowdown in global temperature rise. Knight et al’s statement regarding the recent trend statement is not entirely consistent with that made by Hansen et al., but they are not looking at the same time windows, nor are they looking at the same SAT records (HadCRUT versus GISTEMP), and the HadCRUT is known to not capture the significant warming which has been observed north of the Arctic circle in recent times. You seem to by under the incorrect impression that we should expect a monotonic increase in global SAT with increasing GHG concentrations; that, or perhaps you are happy to try and continue perpetuating that myth and/or keep muddying the waters. Anyhow, one should not expect a monotonic increase and that fact has been stated ad nauseum, yet contrarians jump on every short-term slowdown and/or cooling period with glee. The (appropriate) long-term trend is up and is statistically significant in all the global SAT records, as well at the satellite data. It is really that simple. You are not even close to being on point. I am aware that my conclusions are somewhat different than those of Knight et al. But my method is similar. And since you seem to embrace Knight et al.’s conclusions, you must think their methods are OK.
For some reason, most folks in this thread seem to think that I don’t think the world has been, is, and will continue to warm. I am not sure where this notion comes from. Our current research project is aimed at quantifying the rareness of recent short-term temperature behavior from a model standpoint. If it is rare enough, then it would seem prudent to look into the possible reasons why. Who would disagree with such an inquiry? An honest analysis of global temperature data shows warming of nearly 0.2°C per decade. Cherry-picking short-term trends from noisy data, when such trends vary wildly in sign and magnitude, is a blatant and cynical deception. I commend the author of this post for exposing such dishonesty. I have a web page which explains the issue in more detail, here. Thanks for that, it’s good to see. And I emphasise “slightly”. Very slightly. Good grief, sorry people! I will, eventually (!) get the Hansen link right. Third time lucky? The very fact that short-term trends are variable is precisely the reason we undertook our analysis. That is, to quantify the expected variability in short-term trends as produced by the climate models, and then see how the observed trends fit within the model distributions. This is one way to assess how good a handle a handle that models have on short-term variability. Now are you talking about the analysis WCR posted, described in the first post above? Or are you talking about the paper that’s going to be published? I am interested in discussing the paper, but other seems to interested in the WCR article, that is not as bad as everyone thinks it is if they were to read the whole thing. The statements that everyone seems hung up on are a minor part of the article. PS, to the author of the WCR piece — you’ve failed cite checking that would get an undergraduate marked down and an attorney a strong lecture from a judge or worse. Use an ellipsis before a period to indicate omission of the latter part of a sentence. Place the period inside the closing quotation marks. Otherwise you mislead the unwary reader. Note the space before the ellipsis; together they tell the reader something has been omitted from the quoted sentence. “for the period 1998 to 2008 there is no real trend”. This is why I can’t stand reading WCR; like CO2Science, it’s just dizzying. You have to check every sentence for sloppy mistakes. You have correctly ascertained that we no longer employ a copyeditor. We will gladly accept contributions to help rehire one. 1) These two gentleman understand the difference between noise (short-term) and trend (long-term) and they are intentionally misleading those that do not. 2) These two gentleman do not understand the difference between noise and trend so they should not be discussing such topics in a journal article but instead should be taking a few math courses. The evidence for global warming is all around us. There are multiple lines of evidence for AGW, not the least of which is the coupling of tropospheric warming and stratospheric cooling. There is no global cooling. I don’t think you’ve read much that we have written. Nor do I think that you have familiarized yourself with our latest research. James Annan gives a pretty good synopsis here. I think our math is pretty solid. False. I read the whole enchilada there before this post. Nothing there changes my mind that describing a decade has anything to do with the long-term trend. Especially when it is atmospheric T that is being measured. Why not include the ocean heat content and the cryospheric trends? You know, it was dark last night so maybe, just maybe, the sun has disappeared. Shall I blog on why this darkness raises questions about the sun? Re: the sun. You don’t need to blog about the sun if it rises tomorrow within a few seconds of when you expect it to. But if it rises a minute or two late, it may make you wonder why. Our research is suggesting, using this analogy, that the sun is somewhere between a few seconds to a few minutes late in rising–late enough to start to wonder why. Perhaps it will turn out to be nothing, or perhaps tracking it down will lead to improved models and better forecasts. It seems foolhearty not to investigate. Fair enough, Chip. Good reply. I just worry about the “spin” that may occur by claiming no warming in a decade. We have seen that spin many, many times. Correction, they did not discuss this in a journal article. Silly me, it would never have made it through the review process. Well, maybe at E & E.
IMO, you only have yourself to blame for that. For example, why on earth do repeatedly say (most recently at the Heartland Conference) that that “global warming has stopped”? Perhaps a dictionary definition will help Chip understand? “global warming has stopped” is totally contradictory to your claim that you believe that the world has been warming, and will continue to warm. Which do you believe? If you don’t believe global warming has stopped, as you say you don’t, perhaps you shouldn’t say it has stopped when giving presentations in public. the last ten years. such a short time in establishing a point on warming. What is the important issue is WHY the climate has appeared to have stabalized in the last ten years. Until someone understand Why the last decade results have changed you can’t state that the climate is changing for the positive. To late with all these record warms recorded in 2010 it looks like the change has occured already. Is this supposed “stabilisation” not being confused with a straightforward, every few decades, statistical “lull” as seen throughout the climate record? A bit like when waves at the sea wall lose their momentum before the next waves come crashing in, yet the tide is still rising, and it’s all in very, very slow motion. but more than a link seems needed. First note the long term trend (Figure 21). The trend is up. It is nicely shown as month based moving averages so you can see that it is still up. of these data products is superior. It is likely that other improvements of the ocean data sets will be available in the near future. For example, none of the publicly available global data sets corrects as yet for a data discontinuity that occurs near the end of World War II [Thompson et al., 2008]. Note that none of these adjustments or uncertainties is large enough to alter any of our major conclusions in this paper. Solomon, S., K. Rosenlof, R. Portmann, J. Daniel, S. Davis, T. Sanford, and G.K. Plattner. ScienceExpress, 10.1126/science.1182488, 28 January 2010. Thompson,D.W.J., J.J. Kennedy, J.M. Wallace, and P.D. Jones, A large discontinuity in the mid-twentieth century in observed global-mean surface temperature, Nature, 453, 646-649, 2008. What then of Tom’s Riddle? How can one explain the appearance (data notwithstanding) that the climate has stabilized? Easily. That appearance is generated by certain people who say it over and over. Tom and Chip, Hope this helps. As if to punctuate this thread, NASA announces May 2010 tied for the warmest May ever, following after the warmest April. By noting that there is noise in the system and, as Latif noted ages ago (and was ridiculously misquoted and even unquoted but had words put in his mouth) that a noisy data set can *appear* to have leveled when it hasn’t. Just because you’re now rolling lots of 2’s doesn’t mean the dice is no longer fair. That headline will become commonplace this decade as we come out of the deepest solar minimum in 100 years. It is clear as day to most of us here now but I have to think that after this decade has passed, it will be very difficult for even the most skeptical person to doubt AGW. Will it be too late by then? Don’t bank on it, Scott. Troofers are troofers no matter what the subject, and ideology often overrides reason. Given the number of “troofer enablers” getting famous and making money out of the willing and impressionable, I’m personally convinced this’ll be going on for some time. communicating your message in such a politically sensitive research field must be very difficult. I can understand that if you are skeptic of AGW every leveling of the temperature rise will (briefly?) affirm your statements. Warmists will use rapidly rising periods for their view. Anyway, I think Chip will agree (correct me if I’m wrong) that we have been having quite a significant temperature rise for a relatively long period. Combined with current estimates of “known” forcings, this is somewhat worrisome (at least). However, one thing (well, there are others too) that is missing in our understanding is why the global temperature shows these decadal variations and how they are caused. I’ve been discussing this with quite a few scientists and they too find it puzzling. There are many candidates for decadal variability (aerosols, natural variability etc etc) but they are poorly understood. Though it is not likely, nobody knows if this “leveling” of global warming in the past decade will continue and for how long, or that we will see another period of rapid rising temperatures. The temperature record of the previous century shows many “levelings” and upticks of the warming trend on several time scales. Maybe a better understanding (including more and better ways of obtaining measurements) of “where the energy goes” in the Earth’s climate system can provide answers (if that is even possible). Arjan, I understand that you are trying to nice about it all, but since nature and science are not democratic I ask you consider data. Please look at the Hanson et al. paper that has been linked three times now. This paper has the specific point of laying out and explaining the temperature record during the instrumental period. Note (Figures 10 and 6) a very strong El Niño in 1998, raising the temperature briefly far above preceeding years. Next, note that La Niña brings the temperature back to the 1995 level. Skipping over the next record year after 1998 (2005) note the La Niña of 2008. It is not hard to see that if you choose a period starting with 1998 or shortly before, and ending with 2008, the short term trend is quite unlike the long term trend. This is cherry picking. It makes a poor impression on people who look at the data. “But still, what explains it?” The behavior, or the short term trend? The explanation of the latter is ENSO. You say “Warmists will use rapidly rising periods for their view.” But no. Data and physics oriented people look at the period 1880 – present. There is another serious problem with your wording. Denialism is now a recognized set of tactics. There has been a published paper on it and even a book. The best source on the subject is still the Denialism Blog, and the Denialist’s Deck of Cards which is found there. Everyone should become familiar with the cards for self defense. On the other hand, “warmist” is just a cutesy-smartsy term. It is not a defined general term like “denialist” and cognates. Arjan, it gets worse. Are you familiar with the business of manufacturing doubt? See Doubt is our product. Climate change has been very good for this business. Has the doubt campaign had at least some success with you? You go on to discuss global temperature change over the last century as if it is less understood than it is. Again, see Hansen et al. If you read that and the Thompson et al. paper I mentioned earlier (you can get it from his web site), you will understand that the “hump” in temperature during WW2 is not real. Considering that and other factors mentioned in Hanson et al., you can see that the trend over the last century is not so mysterious. You refer to “… this “leveling” of global warming in the past decade….” Look again at the data graphs and keep in mind that for several decades now, each calendar decade has been warmer than the previous one, and by an increasing amount. The naughties (2000 – 2009) were no exception. Is “leveling” what it would be called if money and politics were not involved? The statement that I am most “hung up on” is the one “there has been no warming whatsoever over the past decade”. This is simply one version of the message that Michaels and Knappenberger repeat over and over, most recently with the Heartland statement that “global warming has stopped”. An oft-repeated crollary is that the “models are failing” (also put forth at Heartland). The statements fly in the face of the evidence of continued significant warming at the decadal and longer timescale as I and many readers have pointed out. Which is it? Has the world been warming and does it continue to warm? Or has global warming stopped? Frankly, this sounds less like a scientist and more like a lawyer acknowledging that the position he is paid to defend is untenable. Exactly both of which I’ve confronted only today elsewhere, within a few posts of each other. The memes are certainly working, but they’re also fun to knock down. It is interesting how quickly the dog-whistles are propagated and go viral, though, even at MSM comment sections. Pete Dunkelberg you missed my point altogether. I wasn’t trying justify this cool decade but it’s anoliminty can’t be reliable in advancing any climate model. The cause of this seemingly global cooling can change suddenly. Then if we look at the first 1/4 of 2010 and all the records we have so far, the tipping point may have been reached. What is most alarming is that over the last ten years we have not had any noticable evidence of global warming. this has lead many into a false sense of lax importamce on global warming. What makes this a tragic because of the false cooling recently, The world is far from ready for this event that’s about occure. Your post @ 1:30 pm is confusing. Could you please tell us exactly what this imminent event is that we are not prepared for? Here’s a graph I posted some time ago that highlights the problem with the analysis of short-term linear fits. Notice the apparent decline from 2001-2009. And yet the long term trend actually rose over the same period! It can’t? Where did you get your nonlinear mechanics PhD??? Go look at the GISS temperature graph. Plenty of cases where the graph “goes down” yet they are still going up. You’re using your eyeball and your wishes to audit the data. Except that each month this year has broken records for temperatures. You know, evidence of global warming. If it makes you all feel any better, perhaps this World Climate Report article from December 2008 may be of interest. 2008 will add another to the growing recent string of years during which time global average temperatures have not risen. Does this mean that pressure of “global warming” fuelled by increasing greenhouse gas emissions from human activity has abated? The answer is a qualified “no”—it seems that natural variations have been flexing their muscles and offsetting anthropogenic warming. There is no sign of any corresponding pause in sea level rise, and since sea level rise is only caused by two things – thermal expansion of sea water and melting of land ice – this is strong evidence that there has been no pause in global temperature rise either. Hence the apparent lack of warming in our data series must be due to shortcomings in our measurement systems rather than a real pause in warming, which (as I understand it) is exactly what Trenberth was saying in his widely and wilfully misunderstood ‘travesty’ comment. The warming is there, as it has to be because of the continuing energy imbalance of the planet (more energy being absorbed from the sun than is radiated away to space) but we’re not yet able to measure where it is being stored in the climate system (although the deeper ocean is pretty much the only place it can be). I think it should be made clear that Trenberth was not referring to “shortcomings” in the surface temperature data. Trenberth discussed difficulties in establishing changes in global energy budget in recent years, based on a wide variety of ocean, sea level and other measurements. Although the sea level budget is reasonably closed for the post-2003 period, the global energy budget is not closed. Increasing land ice melt at expense of ocean expansion to account for sea level rise has consequences for the energy budget. Accordingly another much needed component is the TOA radiation, but CERES data exist only through 2005 and are not yet long or reliable enough to bring to bear on this question. This highlights the need to bring the CERES TOA radiation up to date along with reprocessed cloud data while ensuring that changes in the ocean, sea ice and sea level are maintained with adequate quality control and sampling to provide estimates reliable enough to address the questions posed in the introduction. 2008 was a La Niña year. That’s natural. The year of a strong La Niña was also the tenth warmest year on record. That’s man made. Reasoning like that has led many a college freshman to the purgatory of academic probation…. There has been no statistically significant global warming since 1995. What little warming there has been was purely random fluctuation. [DC: To establish significant warming in the HadCRU data set you have to go all the way back to … 1994. 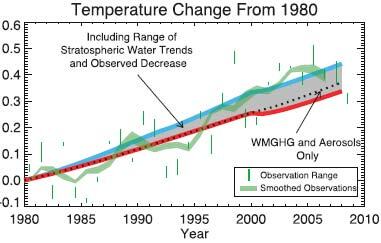 NASA Gistemp does show significant warming since 1995. Tamino covered the topic very well in his classic “How long” post. I covered the the genesis and other aspects of this particular version of the misleading talking point previously. DC, it may be better to show the actual value of the slope and the 95% confidence interval. It appears our ‘skeptics’ don’t understand the little fact that there is an equal probability that the slope actually is twice as large as the probability that the slope is flat. The Economist calls you a liar. So do I. [DC: To be scrupulously fair, it should be pointed out that the Daily Mail actually had a headline “No warming since 1995”, which goes further than the trick question/talking point that Phil Jones answered. AGW Skeptic just doesn’t know any better, so he may not have the awareness necessary to support such a charge. I’d be inclined to give him the benefit of the doubt on that score, but of course that doesn’t change the fact that the “no significant warming since …” meme is a crock. It is depressing that so many think this is actually a valid argument. Gavin’s Pussycat, I state with dead certainty that Morano is a deluded nutcase who is lying to ensure his retirement. Given all the proof you need is dead certainty in the statement, this should be proof I’ve done my homework and my statement is correct. Oh, you were talking about (not a) AGW Skeptic. It’s as true to say that there has been 0.24C warming since 1995. Funny how you don’t go there, isn’t it. There’s about a 2.5% chance that random fluctuations would have had the same effect. There’s about a 97% chance that it couldn’t. The confidence levels DO NOT mean the slope was due to random fluctuations. However, there is a continuing need amongst self-styled skeptics to fail to know what statistics means. Along with anything else that could prove them wrong. And your proofs of this is where? Since you alarmists are the ones who want the rest of us to change our lives to suit your agenda, the burden of proof is on you to demonstrate that global “warming” will mean the end of the world as we know it. It’s called the null hypothesis. If I could just add: not-a’s post is rather unskeptical over the statement “there will be no problems”, isn’t it? Just takes it as gospel truth. The admission that no net warming for the past decade doesn’t mean warming has stopped seems like a disclaimer that the intended audience will simply fail to take real notice of but leaves the authors with a valid sounding response if someone such as DC makes a fuss. As seen above. Admitting that AGW is real is surely followed by a variation of ‘but it is much less of a problem than warmers make out, is probably self limiting and should not be cause to take action to reduce emissions etc”. None of which can be considered an honest interpretation of the entire body of data and scientific reasoning. But, for people who choose to be associated and aligned with Heartland the entire body of data and reasoning is something to be picked through for cherries. Anything because there has been no admission that there is no net warming for the past decade. This is called “fail” on the internets. > You have correctly ascertained that we no longer employ a copyeditor…. That’s no excuse. Say you no longer employ a janitor. Do you not empty your own trash and clean your own toilet? Getting quotations right is your responsibility. When “errors” mislead people to think your argument is stronger than it is, you’re likely to fool yourself. When you lay off a copy editor, your responsibility is to check more, not ignore the work needed. Even Young Earth Creationists — like Appleton out of Australia who become something of an institution — typically know enough to add ellipses and do so. It is just that what they have omitted generally has a rather dramatic effect on the meaning of what they are quoting. But being a godly people they are conscientious enough to flag their dishonesty. I must say I am surprised World Climate Report can’t hold itself up to the same standards as an aging YEC in the Outback. Lack of a copy editor is no excuse. Make mistakes; post errata. Don’t let people copy and repost your mistakes to further mislead readers. Oh, do _these_ guys fail. Rechecking for new misuses of that truncated text, I found this in a filing in the big multiparty suit against the EPA over the CO2 regulations. … temperature did not correlate.21 RTC 3-4 (“if a linear trend is fitted to annual global surface temperature data for the period 1998 to 2008, there is no real trend”) (Ex. 11). Someone ought to be slapped down for this. No doubt they’ll blame a copy editor. Ellipsis points are normally not used … after the last word of a quotation, even if the end of the original sentence has been omitted, unless the sentence as quoted is deliberately incomplete (see 13.53). This one might be pretty useful wrt. UHI effect. I’ve only scratched the surface with Michaels and Knappenberger, and will return to them in due course. Tom Harris is also the prime force behind the International Climate Science Coalition and its sister organizations in New Zealand and Australia. De Freitas continues to be one of the key figures in the Harris network, as seen in the McLean et al ENSO-responsible-for-global-warming controversy. Anyway, I would submit all seven of Michaels’s Climate Research articles deserve to be scrutinized fairly closely. Perhaps we can all do that together soon. Meanwhile, for some of Michaels and Knappenberger’s recent work check out this thanksgiving present, a panegyric to CO2. Presumably the resemblance to Denial Depot is ironically unintentional. You can’t make this stuff up. One wonders when Andy Revkin will ever get around to critically assessing these two, instead of giving them a semi-regular platform to spew their intellectually bankrupt and venomous nonsense. “… Eric Berger, the SciGuy for the Houston Chronicle …. begins, as skeptics usually do, by saying that the globe has not warmed in ten years ….